Apparent RA: 9h 56m 21s Apparent Dec: +69° 39' 23"
200mm F5 newtonian @F5 , SC3.5 toucam RAW mode. IRB + RGB filter. Exposures. 90x3s and 150x11s luminesance. 25x15s each for RGB with colour filters. This is my first visit to M82 this year. 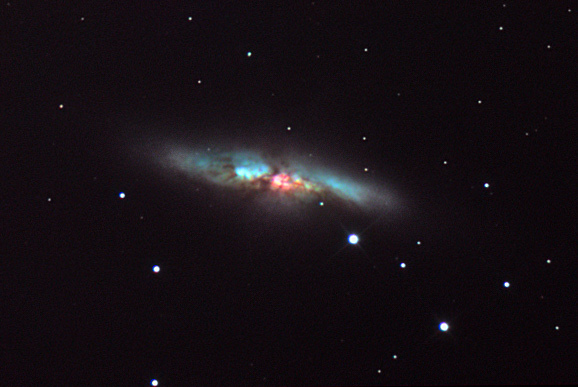 M82 has always had a special attraction for me. I am not sure why, but I have always enjoyed imaging this strange looking galaxy with its intricate dust lanes. I have been looking forward to imaging it with my SC3 camera with mixed feelings. The more sensitve camera should give me a high quality, less noisey image, however, the larger pixel size will compromise resolution. Perhaps one day a barlowed M82! All the AVIs were stacked in Registax 3 with darkframe subtracted and "dark pixels" removed with registax 3 Sigma Clipping. The RGB composite was produced in photoshop, and then then multiple L layers, mixing the shorter exposures and longer exposures used to produce the final image. Slight noise reduction in neat image. The final result was not as good as perhaps it could be - its very hard to balance the bright inner core with the faint outer regions. It was getting late (3am) and the astronomer was rather tired at that point. However, a benchmark for next time.